As Sanctions Squeeze, Iranians Keep Improvising : Parallels Whoever wins Iran's presidential election will face a major challenge: how to revive a struggling economy that is facing tough international sanctions. Iranians have been finding ways around the punitive measures for decades, but are they running out of options? Iranians attend a campaign rally for Saeed Jalili, a leading presidential candidate, on Wednesday. Iranians vote on Friday, and the next president will have to deal with a weakening economy that faces increasingly tough international sanctions. Iranians have lived with American sanctions for many years, and we could see the evidence of this when we stepped into a Tehran shop called GM Auto Parts. It had the famous blue and white General Motors logo, though the sign, like almost everything in the spare parts shop for American cars, looked decades old. 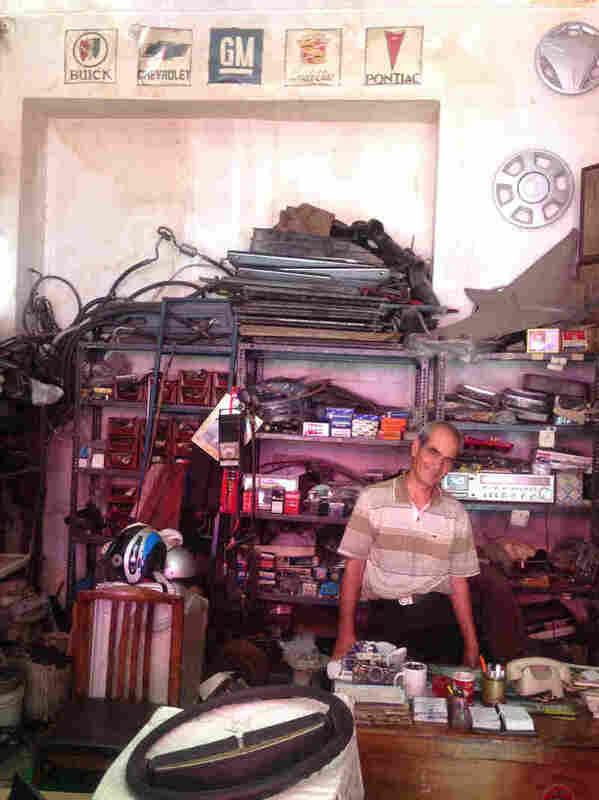 The silver-haired owner, Sadegh Janati, showed us catalogs of cars and parts that he used to import from the U.S. in the 1970s. They came straight from GM, he said, until the years after Iran's 1979 Islamic Revolution, when U.S. limits on trade with Iran began choking his business. But people keep ordering spare parts. The caller on Janati's ancient phone was asking after a fuel line. To service old American cars, like Janati's own Chevy Caprice Classic, he used to have a man in America ship him auto parts in the luggage of travelers. Then, just a few weeks ago, he made a discovery. He went on a pilgrimage to the holy city of Mecca, Saudi Arabia, where there are many American cars — and spare parts stores. He showed us spark plugs he bought on the trip. Iranians have improvised this way for years, but now the improvisation is getting desperate. U.S.-led sanctions, aimed at pressuring Iran over its nuclear program, grow tighter and tighter. Oil production is way down. International banking transactions are now much harder. The latest round of sanctions will make it tougher for Iranians to get spare parts even for their European autos. Some business leaders say they're running out of options. Sadegh Samii, a publisher who also runs an inspection service for imported goods, says sanctions are a major issue. "Well, we have to come to a certain conclusion with U.S. of A. and Europe." This has not been the official line of Iran's government, which has urged resistance to what it calls U.S. imperialism. "They say that we go around the sanctions, but it is making life difficult, really difficult," Samii says. "Because I'm an inspector and I see the goods coming into this country and how difficult, how almost impossible it is for certain traders and merchants to transfer money for imported goods." Banking sanctions are making it harder to complete transactions, and new sanctions also target Iran's currency, which has already collapsed in value. 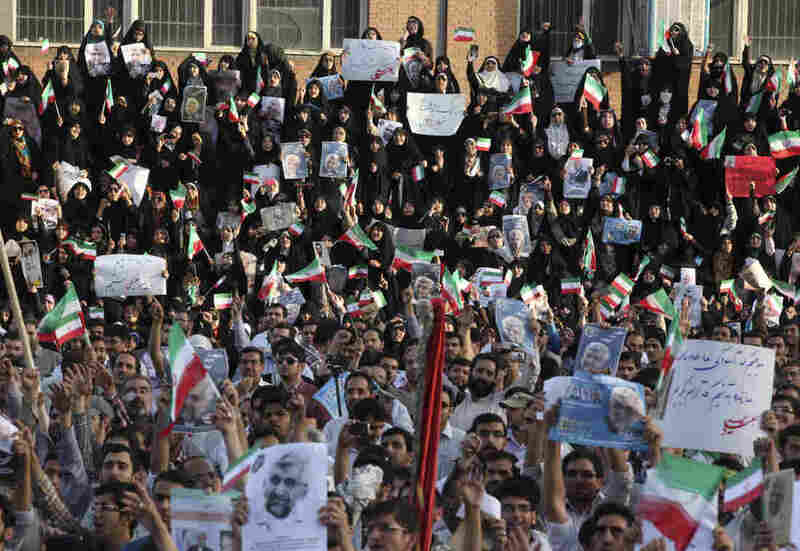 U.S. sanctions are now among the biggest issue in Iran's presidential campaign. But not everybody agrees that it's time to cut a deal over Iran's nuclear program. "The most important thing for us is to resist against the United States because you and your government attack [our] economy," a college student named Ali said at a campaign rally Wednesday for Saeed Jalili, a leading candidate. I asked Ali how Iran can survive its economic trouble. He cited one of Jalili's major slogans: building a "culture of resistance" against the West. Jalili hasn't made clear what this means, but he appeals to Iranians who simply do not believe they can or should give in to the U.S.
Pilgrims at the Islamic shrine of Fatimah al-Masumeh in the holy city of Qum, south of Tehran. Soon the college students sat cross-legged on the soccer field and joined the chants of "Death to America." They also said "Death to Israel," chants Iranian conservatives have repeated for decades. Jalili is Iran's main nuclear negotiator, and his views on everything from the nuclear issue to the role of women are believed to closely track those of Iran's supreme leader, Ayatollah Ali Khamenei. Jalili has the support of other prominent clerics. 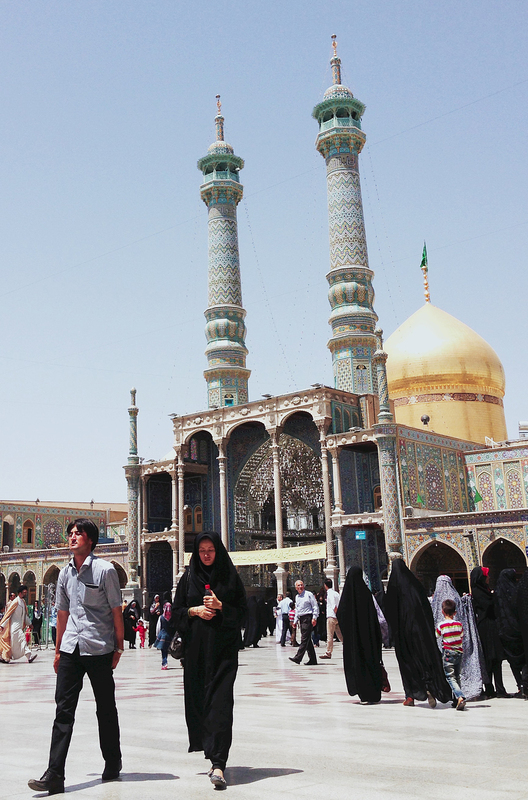 To test that support, we visited a city that's full of clerics: the holy city of Qum, outside Tehran. It's a center of learning for Shiite Muslims and also a destination for thousands of pilgrims, one of the most vital places for the Shiite faithful. It was easy to find people in Qum who support Jalili, but their support was not unanimous. A cleric named Ali, who's studying in a theological school here, said he's voting for a different candidate, Iran's onetime foreign minister, Ali Akbar Velayati. "He's a moderate and quiet person," Ali said. "We have an expression: to move in second or third gear." A country needs moderation, he said, and doesn't have to move at a high speed. His candidate has publicly challenged Jalili's tough stance on negotiating with the U.S. Many of the remaining candidates have clashed over the nuclear diplomacy, suggesting a divide in the country's elites. But that doesn't mean Iran is sure to bend. Back in Tehran, we visited a string of upscale apartment buildings under construction on the northern side of the city, where many of the elites live on slopes of a mountain, with cooler air. The engineer overseeing the building where we stood had a simple explanation for all this construction: "We have lots of rich people in Iran," he says. Even in hard times, when many people lose ground, some profit. Inflation means people with real estate, or warehouses full of goods, can sell for more. Smugglers profit offering to slip in contraband goods. Larger corporations are still maneuvering to bypass Western sanctions when they can. Petrochemical products, for example, may not be sold to Europe but might still be sold to Chinese firms. Iran's economy is teetering. But many firms are copying that GM Auto Parts guy on a grander scale, trying to hold off disaster as long as they can.